Kevin Riefenstahl and family share their journey to find a cure for Type 1 Diabetes. 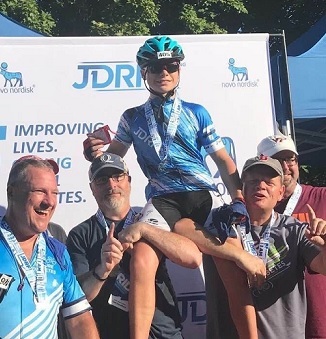 For Chartwell Law partner, Kevin Riefenstahl, life took a dramatic change a decade ago, when his young son, Holden, age four at the time, was diagnosed with Type 1 Diabetes (T1D). Immediately the family connected with the Juvenile Diabetes Research Foundation (JDRF) for support and guidance on how to manage their new reality. But as time went on, the Riefenstahl family became directly involved with the organization’s efforts to raise awareness and help fund much needed research that will help to transform the lives of people with T1D, and to eventually find a cure. The Riefenstahl Family recently shared their story with a local community publication, Mullica Hill Neighbors. Please take a moment to read their inspiring story.